I just received a scam email in my gmail inbox that pretends to be from the RBI. The message dangles the temptation of a windfall of money but asks me to make a payment first. Such emails are very common but there are still many people who fall for this trick, so it is important to throw some light on the situation. This email claims to have come from the RBI. It immediately creates a sense of urgency through the subject that contains the term ‘last reminder’. The mail further states that I have “been listed as a beneficiary in the recent schedule for payment of outstanding debts incurred by the RBI Govt within the period of 2007 to 2012”. The payment type is classified as lottery/inheritance/unpaid contract funds/undelivered lottery funds/charity fund etc. The payment amount is a cool GBP 500,000.00 to GBP 1,500,000.00 pounds [sic]. 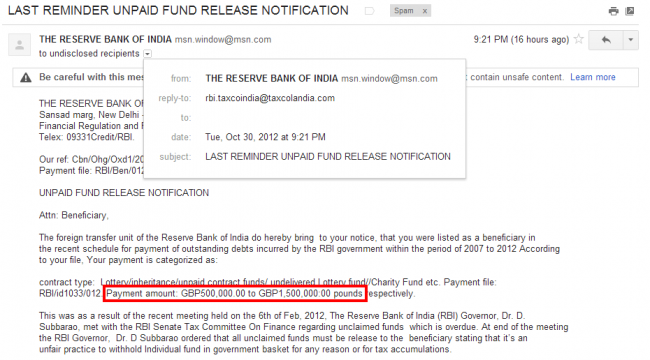 To add further credibility to the email, the name of the Governor of the RBI (Dr. D. Subbarao) is also mentioned. Victims are tempted by the prospect of receiving this huge amount of money and are further convinced that it is an unfair practice to withhold individual funds in a government basket. But then comes the catch. The mail states that Rs. 17,500 needs to be paid to the British High Commission Office in New Delhi for approval of payment. Various details of the receiver are also asked for. These include name, gender, address, phone number, occupation, bank details, photo identity proof and your unpaid fund amount. 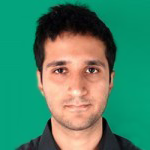 The email is signed off by Dr. Srinath Arora, Secretary to the RBI Governor. Without a doubt, there are many people who may fall for this common scam, with or without the best anti spam software. However, there are several loopholes in this email and all it requires from a potential victim is some rational thought and information on how to avoid the phishing trap. The subject claims that it is the ‘last reminder’. I have never received any such reminders earlier so this immediately makes me suspicious. The reply address contains the term ‘taxcolandia’. Why does the RBI think that I am a beneficiary? I have never had any direct dealings with the RBI, nor have I participated in any lottery. The message body claims it is ‘unfair to hold this amount’. But why will the RBI transfer a sum between Rs. 4.35 crore to Rs. 13 crore to random people? Then comes the most obvious sign that this is a scam. The fact that I have to pay Rs. 17,500. When the email asks for ‘bank details’, it is not clear what details this refers to. There are sure to be some people who will provide confidential data. Lastly, there is a line that says ‘your unpaid fund amount’. Does this imply I can pick out any amount I want the RBI to just transfer to me? It is clear that people need to be careful about such emails. We often feel that these mails are common so nobody falls for them. Unfortunately, there are some people who do fall for scams like this and this. There have been reported cases where individuals have responded to these emails and then been asked for further payment in installments (up to Rs. 1 lac). Some people have also been asked to visit New Delhi to proceed with the transfer. We advise our readers to beware of such emails and scams. I too have received such an e-mail, and wisely decided to delete it. My motto is: Nothing comes free in this world. the same i had received even a RBI letter having govt.of .india symbol with signature of branch manager.but to pay an amount against the full payment,but i said as a poor man pls pay the amount which ever left after the deduction so they stopped responding. Nice article. Thanks for the same. Are there any ways and means to track down these guys? How can these menaces be tackled legally? Can a FIR be lodged? The best thing to do is to report these emails as spam in your inbox and then delete them. Do not fall for what they say even if you happen to open them. Thanks for the informations,which are useless for us.